Lion Breathalyzer, Lion Alcometer® 500 Breath Alcohol Kit, Lion Alcolmeter, Lion Breathalyser, Lion Alcometer, Lion 500, Lion 500 Alcometer, Lion 500 Breathalyzer, Lion Police, Lion SD400 Breathalyzer, Lion Alcoblow, Lion SD400P Breathalyzer, Lion Mouthpieces. 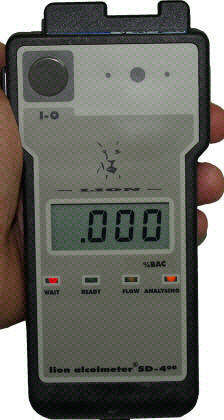 The Lion Alcolmeter series are serious breathalyzers for use when absolute precision is required. If you are unlucky enough to get stopped at the roadside then it is highly likely that the Police will use one of these to assess your breath alcohol content. 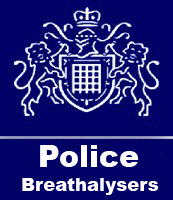 Lion breathalysers are in use with a substantial number of employers and Police forces worldwide, including a large number of UK forces - extreme accuracy when it is needed. A perfect tool for professional level employee screening/testing, including high volume testing of numerous employees on a daily basis. The fuel cell sensor does not lose its accuracy as quickly as the semi conductor sensors on cheaper models and hence only needs recalibrating approx 6 monthly. The Lion Alcolmeter series uses volumetric measurement enabling it to pass stringent UK Home Office specifications for roadside breath testing. Do I Need Specific Training to Operate This Device ? In a word - No ! They are all extremely easy to use and will take minutes to get you up and running. Fit a mouthpiece, turn on. Blow until you hear a 'click' and then read the display - UK Driving limit is 0.350 Mg/L. If the blow is insufficient you will get an error message. Foolproof technology. The Lion 500 Breathalyzer is small in size and weight, yet superbly performing breathalyser. It is in use with many Police Forces Worldwide. Its unique ergonomic design offers ease of use in a compact breathalyser instrument which fits easily into a pocket or clips to a belt. Underneath the attractive exterior is Lion's usual engineering quality, designed to bring you the accuracy, reproducibility, stability and durability you expect from Lion. Switch on, attach a fresh mouthpiece and tell the subject to blow: everything else is fully automatic. The graphics display guides the user through the test procedure. 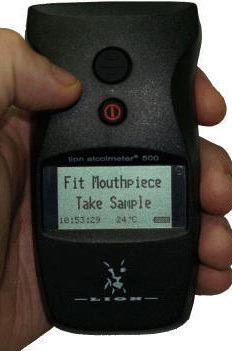 In use with numerous UK & World Police Forces - Breathalyzer technology you can trust ! No training required, very easy to use. A fully automatic, simple to use breath alcohol measuring instrument for use by Police, industry, medicine - and in many other applications. 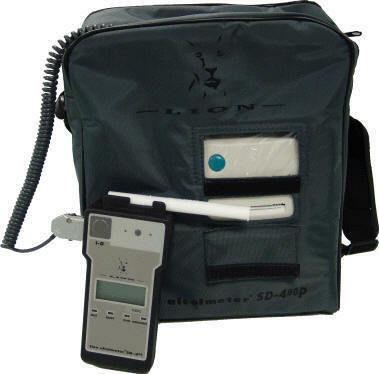 Due to superb accuracy, the Lion Alcolmeter® SD-400 breathalyzer is approved and used in various countries as an evidential instrument. To use, simply switch on, attach a mouthpiece and tell the subject to blow. The subject's alcohol level is shown just seconds later on a large, easy to read display. The reading is then stored in memory, with date and time, for later download to a computer system for management purposes. A reusable plastic sample cup may be used as an alternative to the single-use mouthpiece tube for fast, non-invasive PASS/FAIL precursory testing. Alternatively, connect the instrument to a PC loaded with OnLineTM-400, for a low-cost 'evidential' system. This is a battery-powered portable printer kit (in either soft case or hard case) is available as an accessory for the alcolmeter® SD-400. The high-speed thermal printer built into each printer kit produces a printed record of each test (or of each positive test only, at your option) so that a permanent record exists. Each reading is printed, along with date and time, and calibration reference data. Space is provided for entering the subject details, together with those of a witness to the test, if required. The printer is connected to the alcolmeter® SD-400 by means of a coiled cable, which makes the system very easy to use. The alcolmeter® SD-400 may still be used on a 'stand-alone' basis if required. Whilst the price of the Lion Alcolmeter with printer may seem expensive, consider the cost involved of an employee suspended/dismissed on the results of a 'consumer' grade breathalyzer which is not Home Office approved and the results from which do not stand up in a tribunal. The costs to your business could be substantial if a dismissal is deemed unfair - A Lion Police Grade, Home Office Approved device will give you peace of mind and will stand up to the most severe scrutiny - proven !